16 Commercial Real Estate & Properties in Surry Hills are listed in 4 categories. We have 9 OfficesSale , 6 Retail ShopsSale , 2 Development LandsSale and 1 Other Commercial PropertiesSale . Located on the ever popular Crown Street Surry Hills and offered to the market for the first time in 39 years. 626 Crown Street was built around the turn of the century and presents one of the best version of strip shopping in one of Sydney's iconic suburbs. The commercial property has two separate tenancies with a potential income of $80,000 per annum (when fully leased) giving the investor a secure low risk investment. Additional notable features include: Rear lane access Modern one bedroom residence above shop Vacant possession of shop and current tenant to apartment above High occupancy street One parking space An inspection is highly recommended. Strategically located at the heart of wholesale fashion precinct whilst surrounded by premium commercial office buildings. This property suits a variety of uses STCA being wholesale fashion showroom, cafe, bar, medical clinic, office just name a few. Property highlights: / 110sqm two level terrace sitting on 89sqm land / Original internal settings with great upside to add value / Provision of grease trap / Skylights on upper level / Separate and self contained office/studio from side entry / Five minutes walk to central station and future Surry Hills lightrail station / Quality passing traffic / Please contact exclusive agents for inspection / Highly motivated vendor / OWNER WANTS DEFINITE SALE!! According to Sydney City Council, Land Area 360 sqm approx. Frontages 17m X 29m approx. (3 Street frontages). Floor Space Ratio is 3 : 1. Building height 18 metres. Zoned B4 Mixed Use. Heritage Issues Neutral (not a listed item by either the local or state governments) Permitted with consent Boarding houses; Hotel or motel accommodation Child care centres; Commercial premises; Community facilities; Educational establishments; Entertainment facilities; Function centres; ; There are many variations and possibilities for redevelopment. All developments of any kind are subject to council approvals. The property in offer is situated on a prime corner with substantial frontage to Elizabeth and Cooper Street. This retail investment is leased on a new long term lease to hotelier group Marvan who operate it as "The Evening Star Hotel". 360 Elizabeth Street enjoys a high profile on a main retail street at the foot of the CBD with strong neighboring suburb Chinatown/Haymarket in short walking distance on the corner of Elizabeth and Cooper street between Foveaux Street and Devonshire Street. Surry Hills is an outstanding city fringe location is rapidly becoming one of Sydney's newest inner city residential and business hubs. 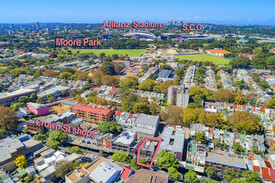 The property is in the heart of the thriving Surry Hills commercial/retail precinct with businesses such Newscorp in the surrounding buildings. Entrance to Central Railway Station and Sydney Buses network are opposite the property on Elizabeth Street. This property is well placed to benefit greatly from the Tram line currently under constructions to be completed 2017/18, providing easy access to the CBD and south to Kingsfords Key features: Two substantial street frontages Leased to Experienced Hotelier New 7 year x 5 year lease $660,000 pa (NET) + GST Tenant pays 100% of outgoings 3% annual increases 451sqm retail area, storage plus 1 car space Prime retail corner position Future potential to subdivide into multiple shops ranging from 25 to 195sqm Future potential to further strata title into multiple shops (STCA) Auction; Tuesday May 3rd 2016 at 10:30am (if not sold prior) Venue: Mezzanine Level, 50 Margret St, Sydney.